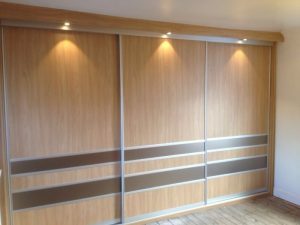 This is a series 700 sliding wardrobe in Stilo Walnut with a silver bronze middle strip, this customer has also used our electrical service and had some pelmet lighting inserted. The extras to this job were, a pull out mirror, pull out tie rail and some belt racks. As this was an old house we have also added insulation to the external walls. ‘Dealing with Nankivells was easy, informative and a pleasure. 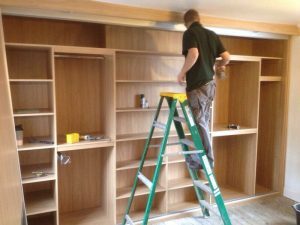 Everyone we met was a credit to the company and the finished job is superb. Despite some awkward challenges in our old house, there was no complaining and the job was completed right on time. Well done!